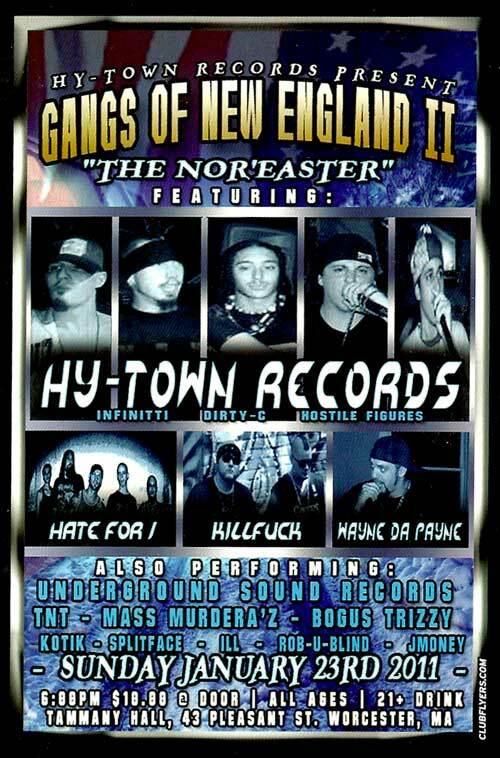 Mass Hip Hop: Hy-Town Records Present: Gangs of New England II "The Nor'easter"
Hy-Town Records Present: Gangs of New England II "The Nor'easter"
I came out of the gym today and this flier was on my windshield. It looked dope, so I figured I post it. Mark your calendars on January 23rd for an ear-splitting, night of Hip Hop, Rap and WickedCore brought to you by Hy-Town Records. Get familiar by checking out the Hy-Town fam on ReverbNation and join their Facebook group page.